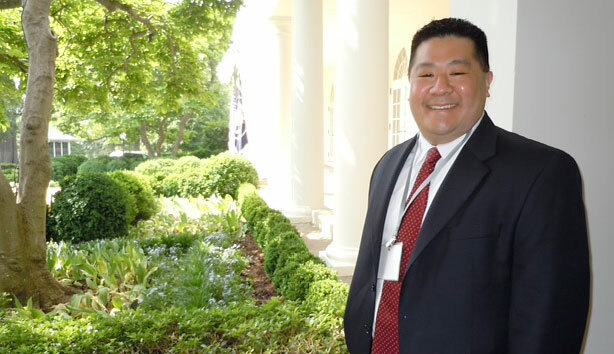 2011 Washington State Teacher of the Year Jay Maebori, along with other state teachers of the year, attended a presidential recognition at the White House. Photo courtesy of Jay Maebori. The White House visit was a highlight for Maebori, but just one of many in 2011. The educators met for the first time, he remembers, in Dallas, Texas. While there, the group shared ideas, swapped stories, and discussed issues in education. “How often do you get a chance to be in a room with a top teacher from every state?” he asks incredulously. He also returned from Dallas with $15,000 in new classroom equipment for his school, Kentwood High School in Covington, Washington, and 49 new friends. "We bonded really quickly," he says, adding that the educators have their own Facebook group and frequently exchange emails. Throughout the year he's also met and talked about issues in education with Washington state Governor Chris Gregoire, U.S. Representative Jay Inslee, and Washington state Senator Joe Fain. Another favorite, and rewarding, experience during the year was being able to choose a person to receive a full-ride scholarship to the University of Phoenix. After reading the applications and essays, Maebori chose a mom who'd dreamed of becoming a teacher now that her children had grown — but didn't have the resources to make it happen. To round out their year, in late July the group attended Space Camp in Huntsville, Alabama; and then in September, the top teachers will be off to Princeton, New Jersey, which will be their final trip together before the states' 2012 Teachers of the Year are announced. So what did Maebori's students think of their teacher's extraordinary year? As fitting for high schoolers, their reaction was mixed. They took pride in having the Washington state Teacher of the Year as their teacher, but Maebori worked hard to minimize his occasional absences, classroom visitors, and other disruptions. In the end, though, "I'm their teacher and they're my students," he says. "I tried to make their school year as normal as possible."